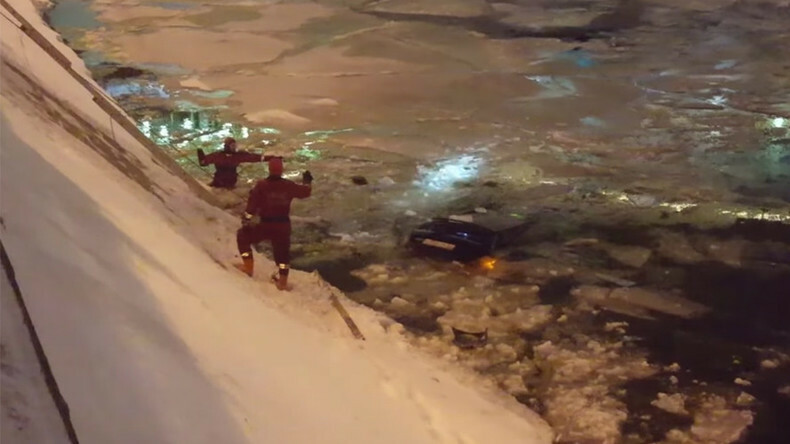 A Moscow traffic police officer and a passing driver braved freezing temperatures and plunged into icy water to save a woman from a sinking car after it was forced into a river in a traffic accident on Thursday. The woman was immediately hospitalized and her Subaru Forester was later pulled out by emergency services. Russia’s Interior Ministry said in a statement that police Captain Aleksey Konyaev arrived before emergency services and decided to waste no time in saving the woman. He was also hospitalized with severe frostbite to both hands following the rescue. “His colleagues and passers-by pulled the drowning woman and the policeman out with a cable,” ministry spokesperson Irina Volk told the press. Konyaev later told TVC channel how difficult it had been to break the window of the sinking car. “We were on patrol and pulled over to see why there was a gathering of people only to find out that part of the river fence was missing. We saw a sinking car with some movement in the back seat, so we immediately thought there were children in there. I called the ambulance and emergency services and decided to jump in. Together with a passer-by, we plunged into the water,” the captain said in an interview with Russian TV as he was receiving a hospital visit from his colleagues and management. Ren-TV reports that the passer-by was Murat Shomakhov, who noticed the accident while driving by, stopped his car, and also jumped into the icy river to help. “The car was in water up to its roof. I jumped in together with a policeman and we pulled her out using a cable,” Shomakhov said. The hospitalized policeman will be awarded a medal for his actions, the ministry spokesman said.